Our Patron: St. John Massias. Saint John Massias, known as the "Helper of the Poor Souls", offered three rosaries every night for the souls in Purgatory, praying for them on his knees despite bodily fatigue. Saint John also sprinkled holy water on the ground several times a day for their relief. He also offered hundreds of short ejaculations ("sudden short exclamations, especially brief pious utterances or prayers") as he went around his regular work, applying the merit of these little prayers to the Holy Souls. Not a day passed that St. John didn't unite himself with the priest at the altar begging the Heavenly Father to grant all the souls eternal rest through the merits of Christ's death on Calvary. 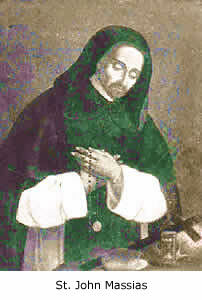 The Holy Souls often appeared to him begging his powerful intercession, "Give us prayers", they cried with one voice. "Oh brother John, you are the friend of the poor and sick! Be our friend too! Help make us worthy to be with God and His Blessed ones."